If you’re a board-game geek and also an anime & manga fan you might have already heard of Yoka Boardgames, which is nothing less than the games division of Tsume SA, a well-renown company that specializes in design of high quality statues in resin, numbered and limited edition, most of them available for online purchase on their official website. Tsume SA works with famous licenses from the Japanese entertainment universe, such as: Naruto Shippuden, One Punch Man, Saint Seiya, Bleach, Fairy Tail, Soul Eater, One Piece: whithin the last few years they are also gaining the attention of the mainstream gaming scene, as demonstrated by their recent work for the Assassin’s Creed brand under the license of Ubi Soft. In this post we’ll be talking about Terra Formars, based upon the acclaimed, award-winning horror-sci-fi seinen manga written by Yu Sasuga and illustrated by the talented Kenichi Tachibana, firstly published in 2011 on the SHUEISHA‘s Weekly Young Jump magazine and then released in a number of countries worldwide: the franchise has been so well received by the public than two original video animations (OVAs) were released in 2014, followed by two animated television series in 2014 and 2015 and even a live action film adaptation directed by Takashi Miike. For additional info regarding the project, we strongly suggest reading the Terra Formars official pages on Wikipedia and MyAnimeList. The board game has been designed by Nicolas Badoux, which also was the guy in charge of Naruto Shippuden, and is basically a dice-rolling card game for 2-4 players and a declared game time of 30-60 minutes. 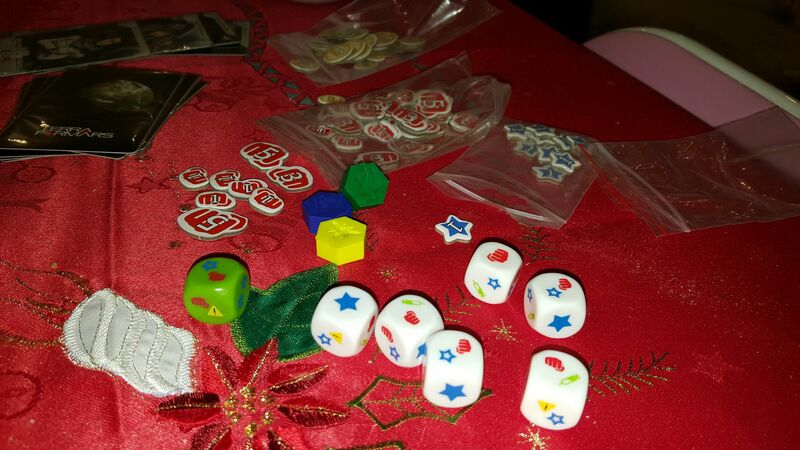 The package is also rather small, as expected for these kind of games: if you expect something like a game board or some miniatures, you’re going to get disappointed; we’re talking about a small-scale adaptation, after all. 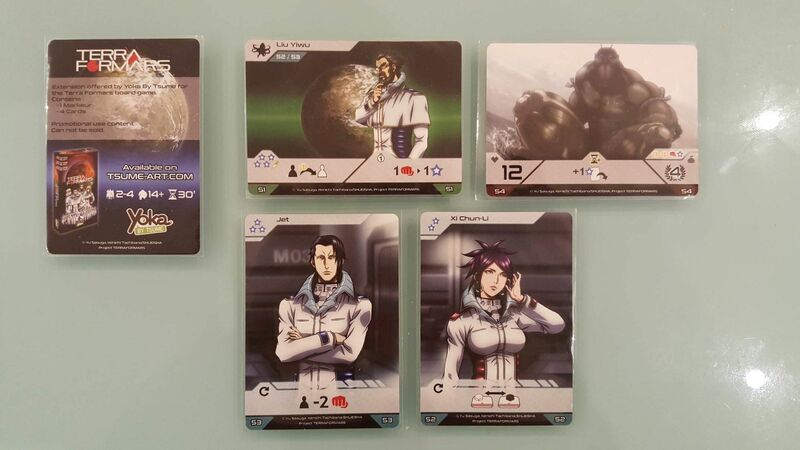 However, as soon as we open it we can immediately see that the designers did a good job to reproduce the visual impact featured by the manga & anime series: let alone the tokens, which are are pretty standard, the cover, the cards and the rules have a stunning appeal thanks to great artwork inspired by Kenichi Tachibana and skillfully adapted for the TV screen by the LIDEN Films techinical staff. 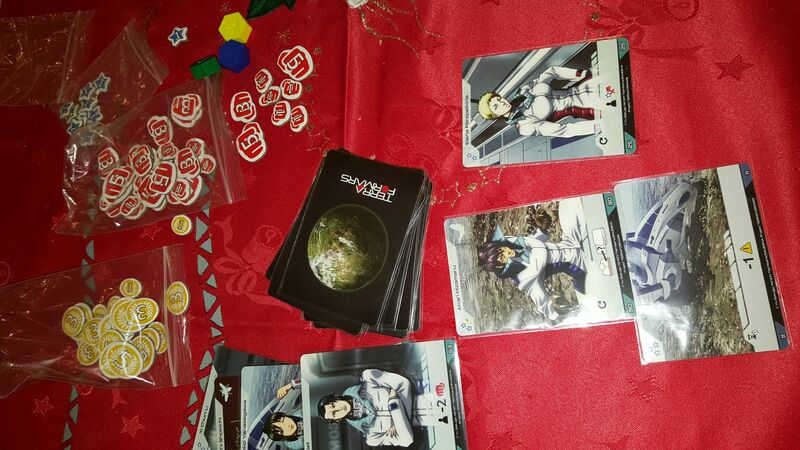 If you appreciated the carachter design of the Anime OAVs and first season more than the cartoonesque look & feel of the 2016’s sequel you will most certainly like the the cards deck, which features a lot of key scenes from those arcs. The game lets the players choose their squad leader (one of the main characters: Shoichi Komachi, Michelle K. Davis and so on): each one of them comes with an unique set abilities, which the game calls Techniques and Talents, and a minimal line-up of comrades, which can be used to trigger one-time effects with the classic play-and-discard rule. The game board is made of a number of face-up support and cockroach cards, coming from their respective deck: the former can be picked by players by paying a cost, the latter depicts the active objectives that must be beaten to score victory points. 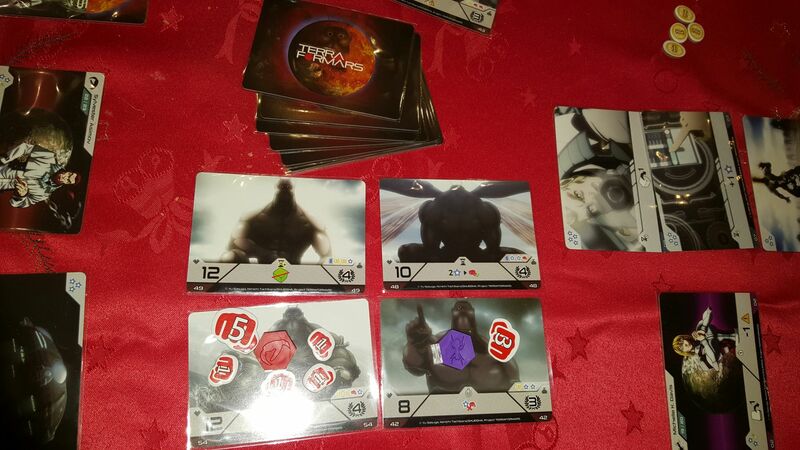 The available actions are determined at the start of each player’s round with a single throw of six special dices featuring various icons: stars, serums, injuries and dangers: the sum of all the icons can be spent during the player turn to perform a number of possible choices, such as: acquire new equipment cards (stars/serums), launch a special dice with additional icons (serums), beat the hell out of the roaches (injuries): the dangers cannot be used by the player as they acts as a disadvantage, possibly triggering the roach defensive ability. The players take turns throughout the whole game by throwing dices, acquiring & play support cards and trying to kill the active roaches to score victory points. Most of the roaches will also drop a loot when killed, which can be acquired by the other players who are also fighting them with the sole exclusion of the one who delivered the killing blow: an equalizing rule clearly designed to enforce player cooperation, which can be also overruled by some (rare) support cards to enforce some occasional sneaky play. 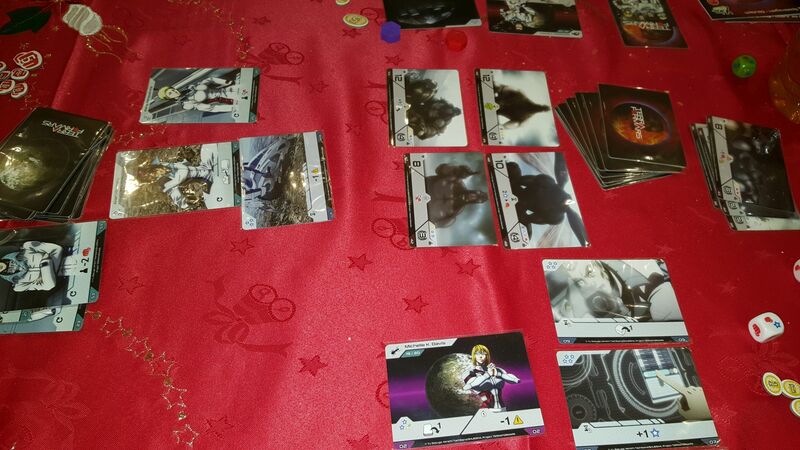 Despite the small size, the game is quite fun: although a bad roll – or a hate card played by an opponent – can seriously cripple a whole turn, the dice-based mechanics mixed with the equipment cards can give the active player a wide amount of options to fullfill the two things needed to win the game: getting as many support cards as you can and use them to deliver massive injuries to the roaches, occasionally crippling your opponents and/or defending your board when they try to do the same. As said earlier the packaging and artwork are both great, yet there’s a big design flaw: the action icons depicted on support cards are rather obscure, despite the player-aid tries its best to explain each one of them. We had an hard time understanding most of them, as the visual language is not user-friendly as it should be for a small-scale game such as this. The good news is that the rulebook comes to the rescue on that, with a full listing of all the cards unique number and a detailed explanation of each one of them: always keep it close to you during playing, as it will save you a lot of time on your first games! Honestly speaking, if you’re a board game enthusiast you won’t be playing it that much: there are simply too many 4-player games better than it nowadays. 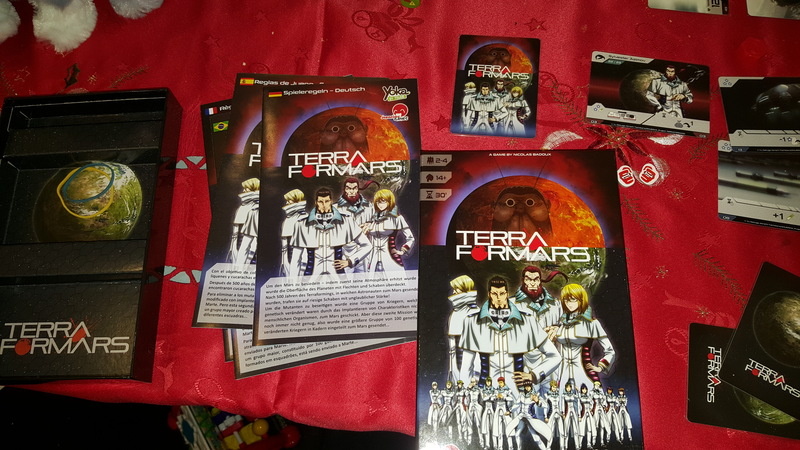 However, if you (and your friends) like Terra Formars you’ll most likely have good fun with it, expecially if/when you don’t have time to explain or play something else, thanks to the easy rules and the short length. Great artwork and stunning theme! Limited interactions between players: it basically is a VP race with indirect obstacles, such as “you won’t get this”, “you can’t use that” and so on. Roaches ain’t scary: they can only die without fighting back, thus translating the gruesome and horror-like mood of the original setting into a methodic whack-a-mole experience. Uncooperative. Although I’m not a fan of most cooperative games, I feel like it would be the perfect chance to design a cooperative + competitive game where everyone could lose, win or try to win alone. Obscure icons. Keep the rulebook at hand! You will need it a lot to “decrypt” most of them during your first games. As you can see, they also come with their own set of (obscure) icons: since these ain’t covered by the rulebook, we put together an unofficial Promo Cards reference guide that you can download & print in case you need some assistance with their effects. That’s it for now: happy playing! Next Article Shingeki no Kyojin – Attack On Titan Season 2 Official Trailer HD with English Subtitles!